I believe the human body was made to move! Our relatively fast and obvious adaptation to exercise is good evidence that we have the ability to optimize our strength and fitness for whatever task we want to pursue. Your body will adapt to any reasonable physical stress you place on it. Not just getting stronger from exercise, but getting weaker from inactivity. I believe through exercise and mobility work we can bring our bodies to an optimally functioning level, avoid injury, and achieve high levels of physical performance. To get to that goal, it is important to practice a diet of whole foods (lean meats, veggies, nuts and seeds, some fruits, and no added salts/sugars), but I also firmly believe that getting outside in the sunlight and fresh air are also essential to a healthy body and mind. Balanced doses of intensities, exercises, and nature have proven to be some of the best ways to relieve stress and anxiety and ultimately lead a happier, healthier life. My goal is to help people improve their overall health so that they are physically, mentally, and emotionally functional in everyday life. To do that we will work together to develop exercise and diet strategies that fit your life. Then let’s find the sport or hobby that motivates you and train to make it safer and more fun for you! Rock Climbing requires a variety of capacities: Strength, Agility, Mobility, Body Control, Endurance, Core Strength like you would not believe! With these and more, it can be hard to organize when to train, how much to train, and what blending of these capacities will be right for you. That is when an outside perspective (like a coach) is needed…more simply, you need to work with Joe! 20 years climbing experience and the right environment (CrossFit Iron Industry) will give you the tools needed to be a stronger climber. I was born and raised in Bellingham. As a kid I mostly liked to play in the woods behind my parents house. I was always the weakest of my friends. Usually coming in last when we boxed, wrestled, or did push-ups. When I was about 12 or 13 I started playing some softball and pickup basketball. My motivation to improve at sports and beat my buddies at push-ups got me started in training. I learned some drills to improve my basketball game and did some weight lifting to try and add some muscles to my skinny frame. My uncle had an old weight set in our barn and I learned basketball and baseball exercise programs from Bill Pearl’s Getting Stronger. Around the age of 15 I found some rock climbing magazines at the library, and after checking out a couple books on the subject I went with a few friends to the local gym to try it out. I was terrible! But I enjoyed it more than any of the other sports and with consistent practice I developed skill and strength, I have been climbing now for over 20 years. I’ve also raced mountain bikes and ran distances from 5k to half marathon. I’ve tried snowboarding and currently race on a friend’s sailboat in the summer. Through these athletic pursuits I have developed strength and confidence as a person. As my interests have evolved one thing has stuck with me, training makes them all better. When I am strong and healthy, performance and recovery come easier. In 2009 I earned my National Federation of Professional Trainers(NFPT), Personal Fitness Instructor certification through Bellingham Technical College. 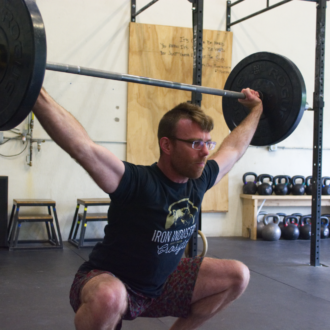 Since then I have trained at the YMCA, Bellingham Fitness, and now at CrossFit Iron Industry. I have taught boot camps, coached climbing, and trained individuals and couples with diverse goals ranging from general health and weight loss to climbing, running, and roller derby. As head coach for the youth climbing team at the YMCA, I’ve worked with divisional and national championship level climbers. But the best thing about coaching kids is there energy and perspective on life. No two are alike, and there is something to learn from each one. It’s an honor to be a part of their development, and humbling to hear how deeply they think about the world around them. I’ve always been somewhat self taught and still experiment with the new exercises I learn so I have hands on knowledge to pass along when i teach them to clients. And although my pursuits have been outdoors and competitive, I want everyone to have the life changing experience that I had when I discovered how an active lifestyle can make you a stronger healthier person. I currently enjoy climbing, hiking, sailing, reading, movies, and learning CrossFit!